This is a design by Susan T. Kerndt that the Foothills EGA canvas groups started in January 2014 as a year long project. As you see, I am a year behind having just started it!! The design is about 10 3/4 inches square and is on 18 count white mono canvas. The light green thread is basting thread that I remove as I go that is marking the dividing bands. I could have drawn the lines on, but chose to baste them. Good thing too since I goofed a few times! The fabric is from my stash and is padded and attached as instructed. It is looking like the fabric I chose will work well with the original colors so I will not have to change anything. Susan used to sell the fabric too, but has run out so you need to supply your own. It was suggested you chose the fabric and then the threads. Some people got bored with the dividers and once they got enough done started stitching within the squares, but I am pretty happy plugging along as is and will do all the dividing bands first. 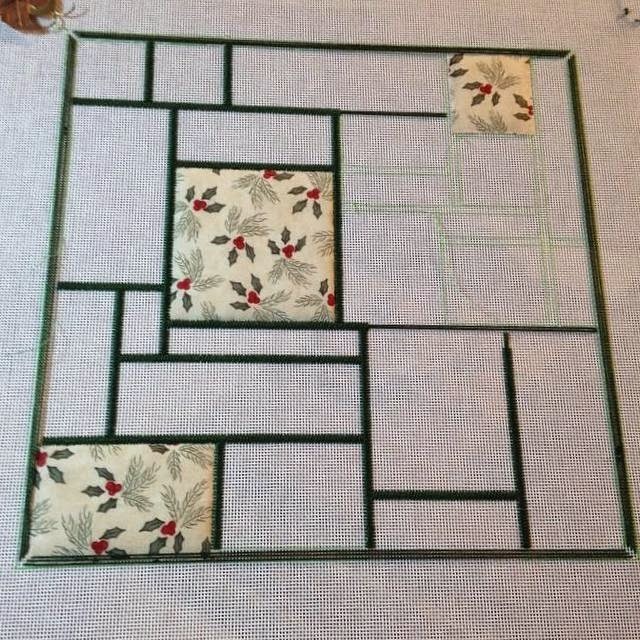 I hope to work on it this year to get it done by Christmas. Maybe posting to the world about it on my blog will keep me on track!! I took a different class with Susan Kerndt at the Richmond EGA seminar and I remember seeing this piece. Great start - I'll look forward to seeing your progress. Halloween Finish for Valentine's Day!